There’s no doubt about it, potholes are a costly problem on Britain’s roads. In the October 2018 budget, Chancellor Philip Hammond announced an extra £420m for local councils in England to tackle the growing number of potholes making for poor driving conditions across the country. Now a whole documentary has been dedicated to the issue on prime time television. Extreme winter weather, such as the “Beast from the East” in 2018, makes the situation far worse. Freezing weather causes expansion – which can lead to voids under patches of road that were already weathered. These patches can become potholes and adversely affect driving conditions on major and minor routes. According to data from Highways England, the number of pothole compensation claims more than doubled in 2017/2018. The data, which they published following a freedom of information request, showed that there were 528 successful claims for vehicle damage caused by potholes – up from 212 in 2016/17 and 187 in 2015/16. Highways England put the cost of settling these claims last year at £164,341. 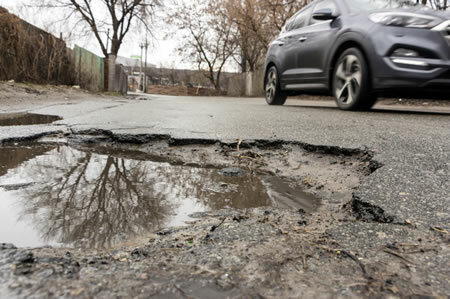 The average pay-out for successfully upheld claims for vehicle damage caused by poor road surfaces was £311.25 in 2017/18 – higher than at any time over the past five years. As long as it is a public road, the relevant council has a legal duty to maintain it to a minimum standard. If they have failed to carry out this duty and your car is damaged, they should pay for repairs. You may have to prove that it was the pothole that damaged your car so photos are a wise move. Try to get close ups as well as shots with context of the surrounding area. If using your phone you can have location enabled to prove where it was taken. Make a note of the time and date. If any witnesses are happy to confirm your statement you could request contact details. Get a written statement from a mechanic about the damage to prove it was caused by impact from the pothole. Report the pothole as soon as you can. If you are not sure who to contact you can put a postcode into https://www.gov.uk/report-pothole and this will redirect you to the relevant authority or council. This may assist your case but also help to prevent more drivers, riders and cyclists from suffering the same fate. Ask for a claims form when you speak to the authority in charge of the road or download one online. These sorts of claims take some effort and persistence but there are many forums and social media groups focused on this topic. People who have been successful will often be happy to answer your questions and offer tips that helped move their claim over the finish line. If the compensation offer you receive does not cover your costs, provide evidence to back up your claim and request a revision. If your claim is rejected there is still a course of action you can pursue through the small claims court. (Ombudsman in Northern Ireland). You have a choice here. Claim on your insurance or claim compensation from the council. There’s no middle ground as you cannot do both. In fact, if you receive both a compensation pay-out from the council and your insurance claim pay-out, the money from the council is actually owed to the insurer. Your insurance may be less hassle than claiming against the local authority and that is something for you to weigh up. You will need to have comprehensive cover of course and to consider your no claims bonus and any excess. Also, if any tyres are damaged and need to be replaced, the insurance company is likely to make a deduction based on the number of miles the damaged tyre(s) has covered. Whether or not you make a claim against the council or via your insurance, do ensure that your car is roadworthy before you drive the car again. Safety first. Are your tyres roadworthy? Read our handy guide.